Care Moves. Roll With It. At Altus our goal is to improve how clinicians and staff work. We’ve spent the last 25 years innovating to build the best workstation solutions on the market. It’s not only about finding an affordable solution, but finding the most ergonomic, durable, and intuitive workstations. 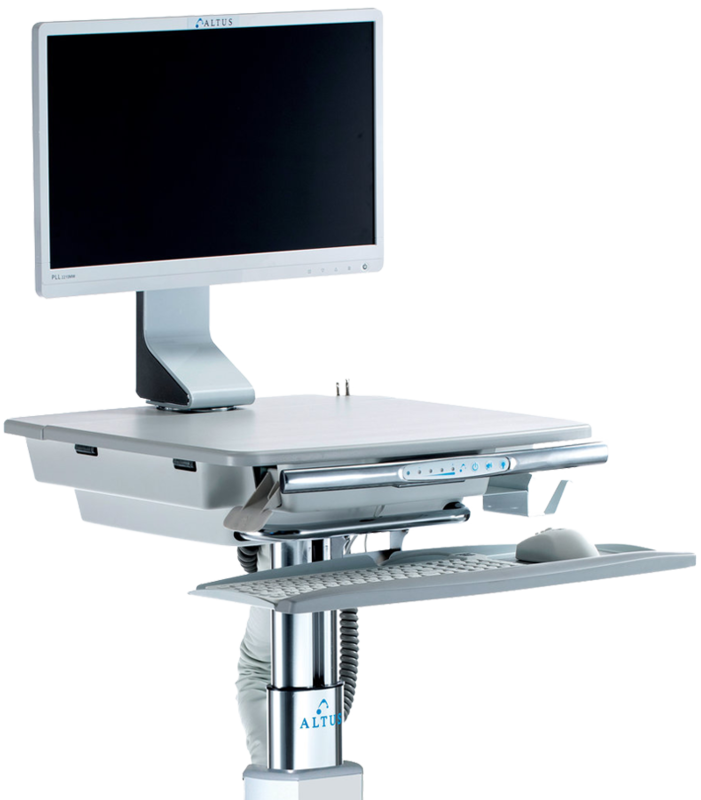 Our sit-to-stand workstations are built to improve comfort which in turn increases productivity. We understand there is power in productivity. We study how real people work to enhance their workflow. Our innovative designs help clinicians, educators, and staff face a wide range of challenges. 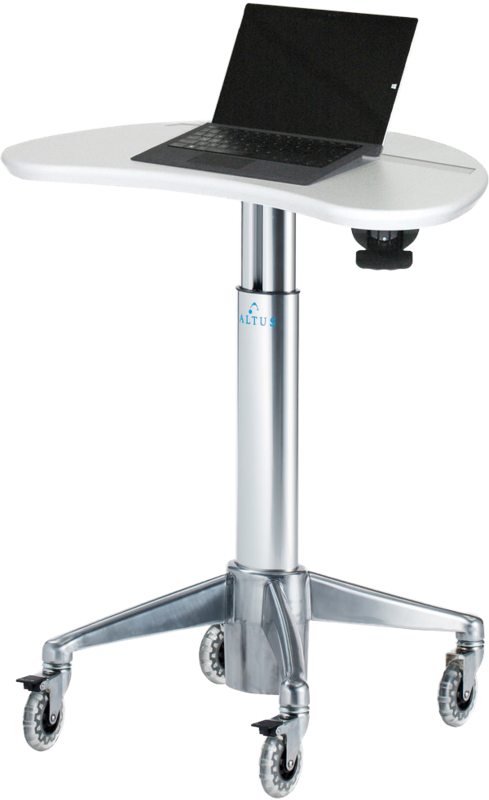 Our Altus technology workstations offer optimized mobility, adjustability, access to patient data, and improved clinician well-being. 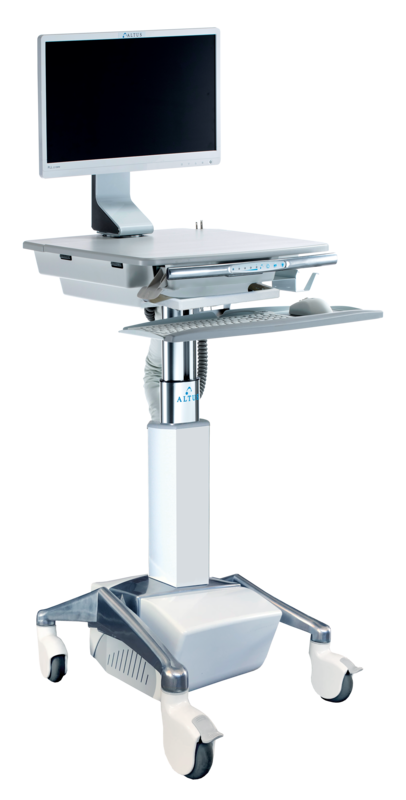 Our workstations work in a variety of environments, from a classroom to an emergency room. Healthcare system’s IT staff are now busier than ever. With the ongoing digital transformation and managing the equipment that goes with it, you need a company you can trust. Click here to learn how Altus can help. Nursing are faced not only with their traditional daily tasks of caring for patients, but are now also responsible for hours of documentation due to new electronic medical records (EMR) added to their shift tasks. Click here to learn how Altus can help. Pharmacy is often held responsible for helping reduce medication errors and yet make it simple enough to not burden clinicians with complicated processes. Click here to learn how Altus can help. We are firm believers in 'try before you buy'. After narrowing down the choices, our local reps can work with you to get a trial on-site for 30-days that is designed exactly the way you want it. We know you'll love it ... that's why we offer it for free. At Altus, our products are built to last, but on the rare occasion you have an issue, we have highly-trained individuals located near you to help decide on what process works best for you and your needs. Click here to learn about our durability and warranty. It is our goal to make sure we are providing the best possible solution for the clinicians, IT, facilities, and ultimately the patients within your healthcare facility. We will take the time to help understand the way you work today and how we can help you be more productive and efficient.